​The Urban Partnership's 10-Year Initiative To Build Economic Security In Low Income Communities Of Color Moves FORWARD. ​The Urban Partnership is proud to release the Progress Report for its 10-year Initiative to build economic security in low income communities of color. 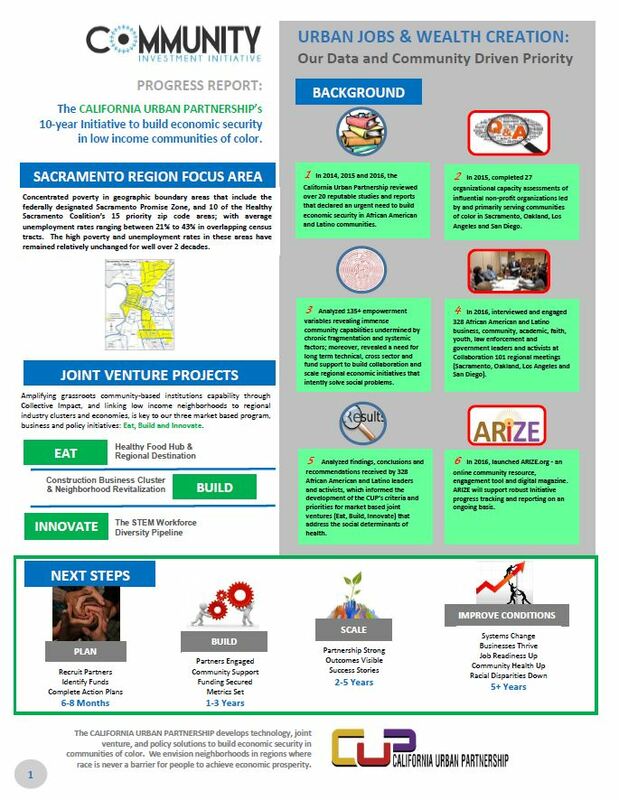 The report highlights Sacramento region EAT, BUILD and INNOVATE action plans focused on developing exciting hubs for healthy food and the arts, construction business clusters that play a role in revitalizing neighborhoods, and preparing more African American and Latino youth for successful education and career paths in science, technology, engineering and mathematics. Two years ago, the Urban Partnership’s board of directors set in motion the organization’s Community Investment Initiative. Since that time, the Urban Partnership has interviewed and engaged 328 African American and Latino grassroots stakeholders at its regional meetings. The Progress Report describes other steps taken to shape the Initiative, as well as details on EAT, BUILD and INNOVATE. The Urban Partnership is supporting community leaders in the public, private, and nonprofit sectors in taking bold steps to connect vulnerable communities to economic and educational opportunities. “To fight poverty and have a better future, the Sacramento region must have growth that is driven by fairness and equity. That means creating situations that allow everyone to participate and prosper,” said Urban Partnership board chairwoman, Bonnie Garcia.